Introducing the New Elecro 700 EVO Stainless Steel Aquatic heater which has been designed especially for the Fish & Koi market place. The New Elecro 700 EVO Stainless Steel Aquatic heater offers all-season temperature control for professional fish keepers, breeders & hobbyists. The all new Elecro 700 EVO, featuring analogue temperature control accurate to 1.2ºC and new ultra-efficient super long life heating element(s) produced specifically for aquatic applications. The Elecro 700 EVO have been designed for safety and easy installation. All Elecro 700 EVO heaters come fitted with 1.5 inch BSP female threaded adapters for ease of connection. The Elecro 700 EVO Aquatic heater is manufactured from top quality components and material. Construction consists of a flow tube which is fitted with inlet and outlet mouldings manufactured from specially formulated polymer alloy material. The outlet moulding accommodates a reversible flow switch (allowing water input from wither direction) with a gold tipped reed switch and Titanium fulcrum pin. The inlet moulding has been designed to ensure full immersion of the elements, greatly reducing the risks of air locking. The heater is supported on two swivel feet; these can be rotated to permit either wall or floor mounting. The heater control components are positioned on the front face of the electrical enclosure. The desired water temperature can be easily selected on the EVO heater using the panel-mounted thermostat dial. The single or three-phase power is supplied through a top quality Schneider contactor. Safety and equipment protection is provided by the highly reliable flow switch. Over-temperature protection is provided by the thermal cut out (manual reset). The 6 kw and 8 kw heaters are made to order and can not be returned once ordered, unless faulty or needing a service. The Elecro 900 EVO Stainless Steel Aquatic heater has been designed especially for the Fish & Koi market place, suitable for Koi Ponds & Quarantine Tanks. The Elecro 900 EVO offers precise all-season temperature control for professional fish keepers, breeders & hobbyists. All heaters come fitted with 1.5 inch BSP female threaded adapters for ease of connection. Elecro Koi Pond heaters help the koi keeper to have full control of the pond environment. Higher water temperature over the winter means we are able to feed our Koi for the whole twelve months of the year so they are getting the full nourishment they require to keep them in good condition, furthermore our Koi grow at a faster rate all year. 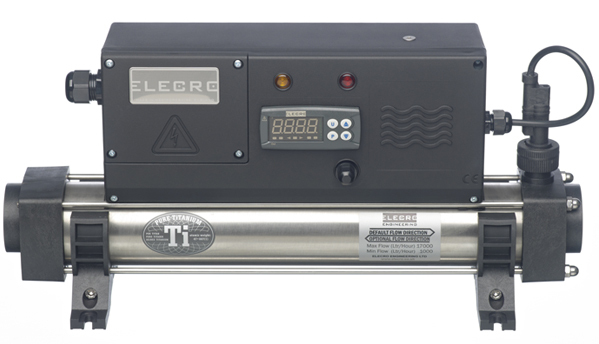 The Elecro 900 EVO Aquatic heater is manufactured from top quality components and material. Construction consists of a Stainless Steel flow tube which is fitted with inlet and outlet mouldings manufactured from specially formulated polymer alloy material. The outlet moulding accommodates a reversible flow switch (allowing water input from wither direction) with a gold tipped reed switch and Titanium fulcrum pin. The inlet moulding has been designed to ensure full immersion of the elements, greatly reducing the risks of air locking. The desired water temperature can be easily selected on the 900 EVO Aquatic heater using the easily programmable digital thermostat. The single or three-phase power is supplied through a top quality Schneider contactor. Safety and equipment protection is provided by the highly reliable flow switch. Over-temperature protection is provided by the thermal cut out (manual reset). Using the Elecro Koi Pond heaters helps avoid some of the parasite problems that can arise as water temperature fluctuates in the spring. The risk of losing our Koi has been dramatically reduced because we have been able to maintain a temperature acceptable to them. Because we have been able to continue feeding we still have mature biological filtration, which means we don't have to go through the process of 'Starting Up' our systems at the beginning of each season. The Elecro 900 Evo Stainless Steel Koi Pond heaters have been designed to the highest standards to give long lasting and accurate temperature control for Koi ponds. These Elecro Evo 900 Pond Heaters offer precise all-season temperature control for professional koi keepers and koi breeders. Elecro Koi Pond Heaters Feature digital control and new ultra-efficient super long life heating element. The Elecro Koi Pond Heater as been Designed for safety and easy installation. The Elecro 900 EVO TiTANIUM Aquatic Pond Heater has a Titanium Element ensuring its suitability for use on most Aquatic Systems. The decision to produce a Titanium element heater was made for a number of reasons. With outstanding resistance to fatigue and erosion, Titanium has a low density, excellent strength and has super corrosion resistance. It is considered to be physiologically inert. Construction consists of Titanium flow tube which is fitted with inlet and outlet mouldings manufactured from specially formulated polymer alloy material. The outlet moulding accommodates a reversible flow switch (allowing water input from wither direction) with a gold tipped reed switch and Titanium fulcrum pin. The inlet moulding has been designed to ensure full immersion of the elements, greatly reducing the risks of air locking. The desired water temperature can be easily selected on the 900 EVO Aquatic heater using the easily programmable digital thermostat. The single or three-phase power is supplied through a top quality Schneider contactor. Safety and equipment protection is provided by the highly reliable flow switch. Over-temperature protection is provided by the thermal cut out (manual reset). As with the stainless steel model all the Elecro 900 EVO TiTANIUM units come fully equipped with Digital control for the precise all season temperature control demanded by professional fish keepers, breeders & hobbyists. Our highly sensitive flow switch, high limiting safety thermostat and integral contactor / relay are fitted as standard, an optional 24 Hour time clock is also available. The Titanium Evo 900 heaters are designed for safety and efficiency. They are as easy to install as the stainless steel model, with the option of water flow from either direction. The Elecro 900 EVO TiTANIUM Aquatic Pond Heater is the latest addition to our growing product range. Pure Titanium flow tube and Titanium Elements ensure its suitability for use on All Aquatic Systems, including salt water / tropical marine. The decision to produce a Titanium heater was made for a number of reasons. With outstanding resistance to fatigue and erosion, Titanium has a low density, excellent strength and has super corrosion resistance. It is considered to be physiologically inert. Therefore, this new Elecro 900 EVO TiTANIUM Aquatic Pond Heater is also suitable for heating acids and virtually any other liquid. The single or three-phase power is supplied through a top quality Schneider contactor. Safety and equipment protection is provided by the highly reliable flow switch. Over-temperature protection is provided by the thermal cut out (manual reset). As with the stainless steel model all the Elecro 900 EVO TiTANIUM units come fully equipped with Digital control for the precise all season temperature control demanded by professional fish keepers, breeders & hobbyists. The New Elecro Satellite Aquatic heater has been designed specifically for applications where the Elecro Pond heater must be inaccessible sited, allowing full monitoring and control of the heater from a remote location (up to 5-metres from the heater). The New Elecro Satellite Aquatic heater is available in Stainless Steel for fresh water applications or Titanium for salt-water applications. 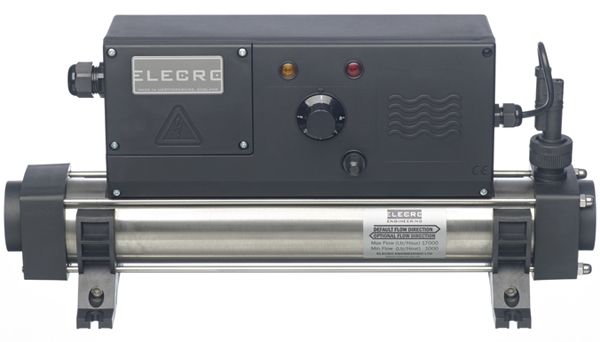 The New Elecro Satellite Aquatic heater has been designed for safety and easy installation. The Elecro Satellite heater comes fitted with 1½'' BSP female threaded adapters for ease of connection. The Elecro Satellite heater control circuit includes a highly sensitive flow switch that requires only 1,000-litres per hour of flow, contactor, high limiting 55ºC safety thermostat (manual reset) & a powerful CPU driven digital thermostat. The Elecro Pond Smart Digital Control is the intelligent pond or pool control system that allows you to control and maintain your pond to the perfect temperature as economically as possible. The Elecro Pond Smart Digital Control is supplied fully equipped with flow switch, temperature sensor probe fitted in custom pipe work T-Piece, for simple integration into any pool technical facility. Priority heating is when the Pond Smart digital controller can determine that the ponds temperature has dropped below the minimum required temperature and then switches the ponds heating product (via the control cable) so that the heating product can heat the pond back to the minimum temperature. Once the minimum temperature has been reached the heater will also switch off. The Elecro Pond Smart Digital Control has been designed to be the most economical heating controller available, by allowing the use of 2 set points you are able to select a higher set point for when fuel is cheaper (i.e. off peak) and then a lower set point for when fuel is more expensive (i.e. peak rate). It is recommended that the lower set point is programmed to be your absolute minimum temperature, if the pond then drops below this temperature during the day the heater can top up the heat to keep the pond at the minimum temperature. Here at Absolute Koi we are often asked to produce special one-off heaters for unique applications or to produce small batch runs of custom built heaters tailored to the customers requirements. These can be as diverse as a recent custom built order for a 360-kW multi bank fountain heater, as well as the more commonly requested, power rampable single phase domestic pool heaters. As a company we are always willing to discuss installations that require a custom built heater and suggest solutions. Whether it's a heater with a power output not offered in our standard range or a heater to be used to heat a corrosive liquid, our technical team will always be pleased to help. To discuss your requirments in more detail please contact us on +44 (0) 1909 476553 or email us through our contact us form at the top of the page.